UPDATE: Sony launches Google TV powered Blu-ray and network media players | What Hi-Fi? We can bring you an update on Sony's forthcoming Google TV set-top boxes, due to launch in Europe this summer, having just seen a prototype at Sony's Tokyo HQ. The NSZ-GP9 with built-in Blu-ray player is due in August and will cost £300. Both it and the streaming-only NSZ-GS7 model (above) come with a touchpad controller which has a full Qwerty keyboard on the back. Further details in our original CES story below. 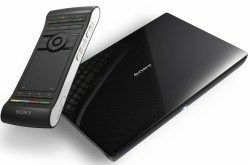 Sony has announced two new Google TV products, a Blu-ray player and a network media player, set for release this summer. The devices will bring web browsing, apps and live TV via the Google TV internet TV platform. The NSZ-GS7 network media player and the NSZ-GP9 Blu-ray player (pictured) both come with a remote control that packs a full keyboard, touchpad, microphone for voice control and motion controls. Google's search power will allow users to search for content across live broadcasts and web content, as well as accessing thousands of apps as they watch video. The players promise to connect to Apple and Android devices, allowing you to share content wirelessly including 'throwing' video content from a portable to your TV using Sony's Media Remote app.